“There is an old time consciousness, and there is a new one. The first attends to individualism. The new tends toward the universal”. 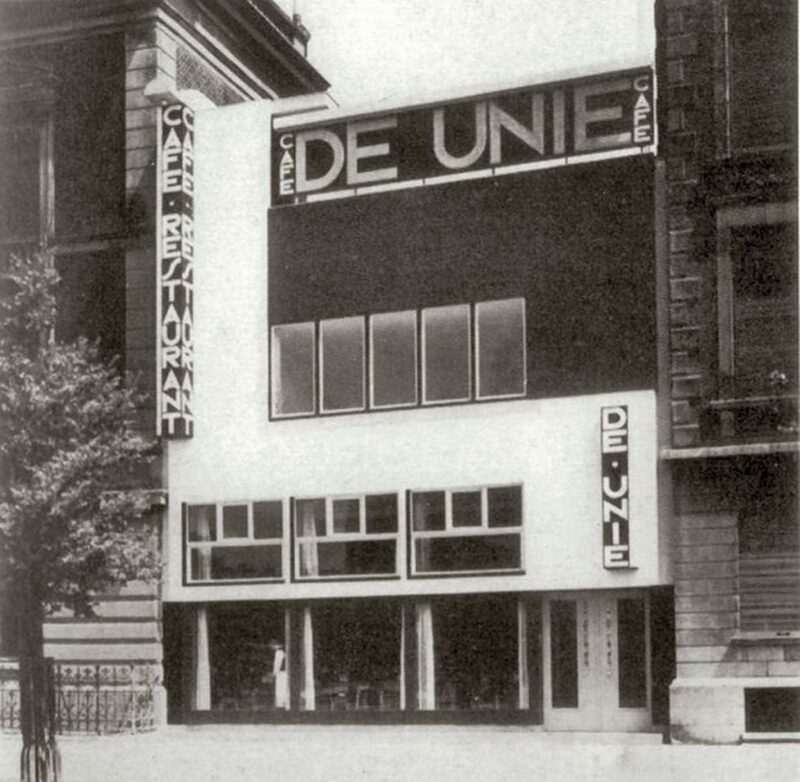 The compositional similarities between the pictorial work Tableau I by Piet Mondrian in 1920 and the design of the street elevation of the De Unie café by J.J.P. Oud of 1924, respond to the principles enunciated in the manifesto no. 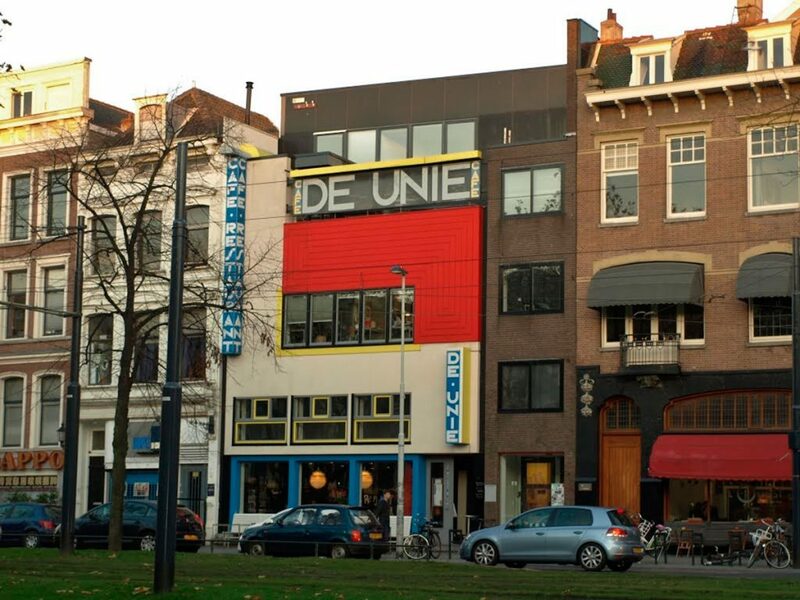 I of the De Stijl movement. This event is paradoxical taking into account the events that occurred prior to the construction of the work. Oud, member of active participation in the founding of the group, never signed the founding manifesto. His architectural activity was not attached to any avant-garde discourse, stories that he considered appropriate for painting. Neither agreed with the concepts of Mondrian, who declared that the aesthetic principles underlying all artistic forms were born of painting. Under these conditions in 1921 there was a break in the relationship between Oud and Theo van Doesburg and their gradual withdrawal from the group. However, when he is commissioned to design the façade of the De Unie café, Oud proposes a composition that respects the basic neoplasticist concepts: a balanced geometric game with colored planes arranged horizontally and vertically. 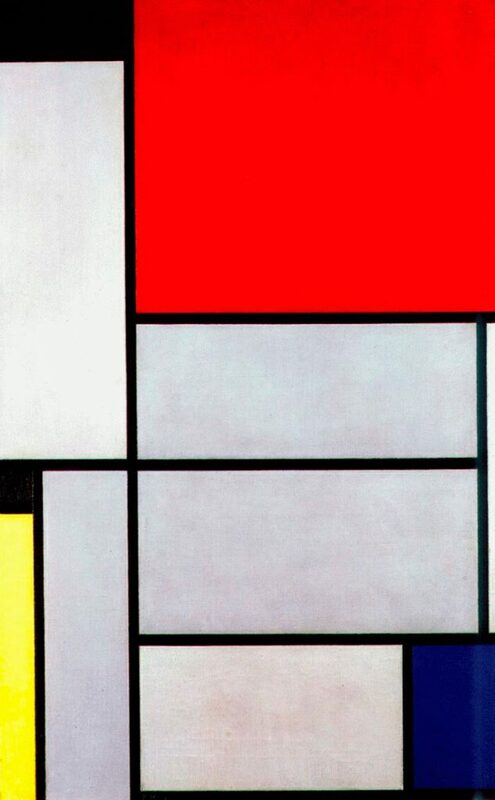 The similarity in the arrangement and balance of plans in the façade with the aforementioned pictorial work, validates Mondrian’s statement that displeased the Oud himself. The elevation is treated as a plane with reliefs, where columns, windows, blind planes and gutters acquire an artistic value. 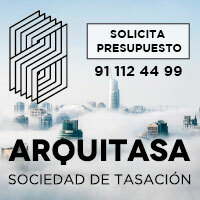 The only three-dimensional elements that stand out from the facade plan are the signs identifying the premises. The work had a temporary purpose. It is proposed to occupy a vacant lot for a period no longer than 10 years. It is likely that Oud opted for a design that breaks the historic tradition of staggered fronts in the city, encouraged by the temporary nature of the work. 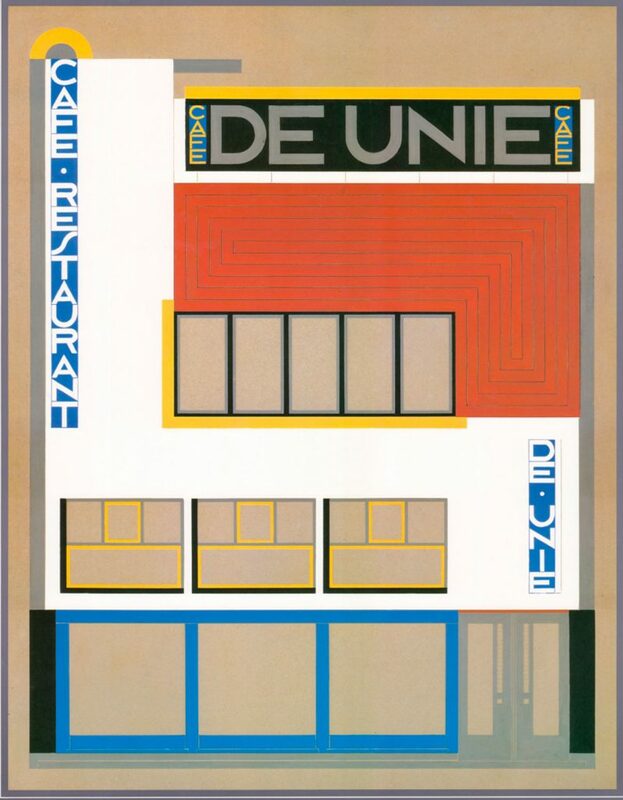 Café De Unie is the only work of the De Stijl group that ratifies the concepts poured by Mondrian. The iconic character of the work prevented its demolition within the stipulated deadlines. However, the bombing of Rotterdam in 1940 put an end to the building, rebuilt in 1986 on similar land near the original site, under the direction of architect Carel Weeber.